The play concludes five years later. Prior and Louis [once lovers] are still separated, but Louis, along with Belize [a former boyfriend of Louis’s and a former drag queen, now a nurse], remains close in order to support and care for Prior; Harper [Joe Pitt’s wife] forgave Joe, but refused to stay with him, instead moving to San Francisco; and Hannah [Joe’s mother] has found a new perspective on her rigid [Mormon] beliefs, allowing her to accept her son as he is. Prior, Louis, Belize, and Hannah gather before the angel statue in Bethesda Fountain. Prior talks of the legend of the Pool of Bethesda, where the sick were healed. 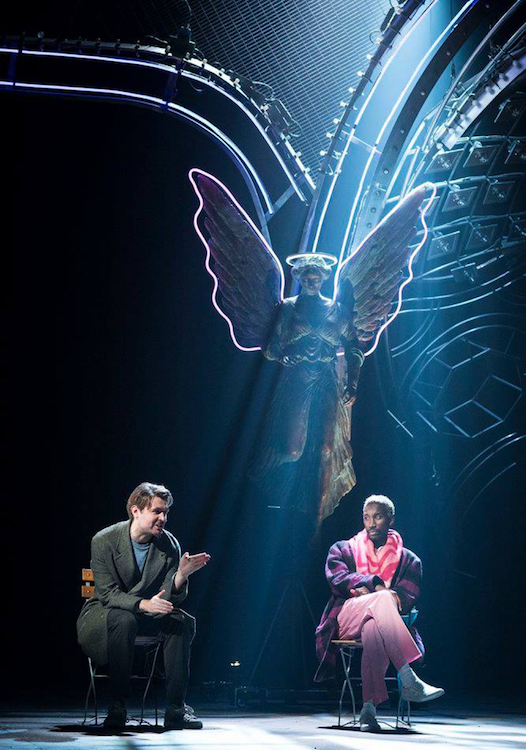 Prior delivers the play’s final lines directly to the audience, affirming his intentions to live on and telling them that “the Great Work” shall continue. In between, there’s a great deal: Roy Cohn, attended by Belize and the shade of Ethel Rosenberg, finally dies of complications of AIDS, and Louis (having abandoned his new boyfriend Joe over Joe’s association with the abominable Cohn) reluctantly says Kaddish over Cohn’s body; Prior, abandoned by virtually everyone, is taken in hand by Hannah Pitt (occasioning one of the funniest lines in the play, Prior explaining who Hannah is: “She’s my ex-boyfriend’s boyfriend’s Mormon mother”); Prior ascends to heaven (on Jacob’s ladder) and confronts the angels there; and much more. The scenes in Part Two are mostly longer than those in Part One, and focus on two or three characters in an extended substory. They are also much denser in allusion and allegory, not always entirely coherently. Part Two is especially dense in allusions to the Jacob of the Hebrew Bible: at some distance, to Abraham’s willingness to sacrifice his son Isaac (Jacob’s father) at God’s command; indirect allusions to Jacob as the new beginning, the embodiment of Israel (with his twelve sons as the progenitors of the tribes of Israel); references to Jacob’s stealing Isaac’s blessing from his brother Esau, and to his buying Esau’s birthright from him (echoes of Cain and Abel here); Jacob’s ladder; and Jacob wrestling with God in the form of an angel. The title of this posting. 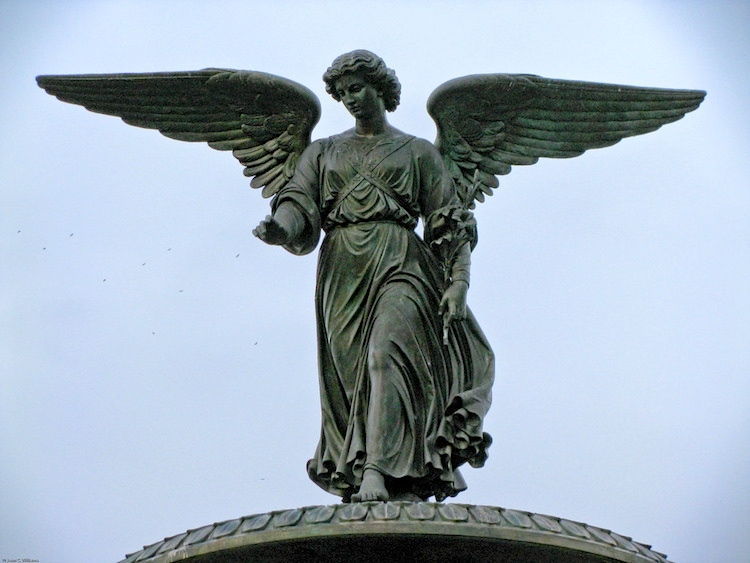 A POP (phrasal overlap portmanteau): The Fountain of Angels (alluding to the Bethesda Fountain) + Angels in America. 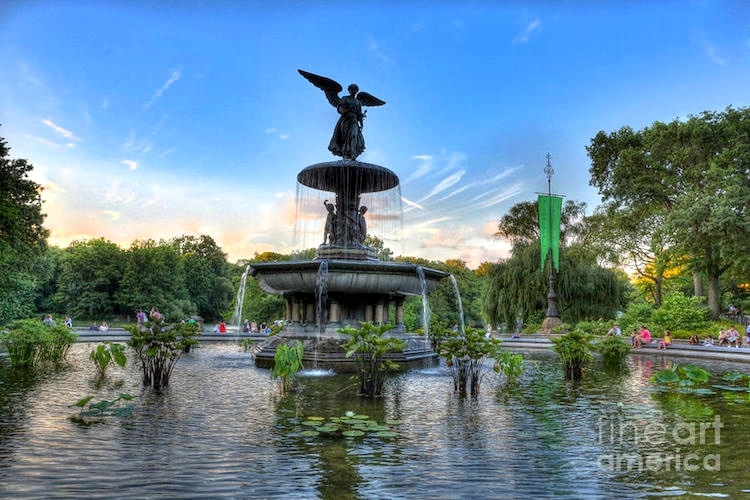 The Fountain of Angels, in turn, is an crude portmanteau (without overlap): The Fountain of Youth (alluding to the healing, life-giving properties of the Bethesda fountain) + The City of Angels (alluding to Los Angeles, where the play was first conceived and where Millennium Approaches had its premiere). The Pool of Bethesda is a pool of water in the Muslim Quarter of Jerusalem, on the path of the Beth Zeta Valley. The fifth chapter of the Gospel of John describes such a pool in Jerusalem, near the Sheep Gate, which is surrounded by five covered colonnades. It is associated with healing. Bethesda Terrace and Fountain overlook The Lake in New York City’s Central Park. The fountain is located in the center of the terrace. 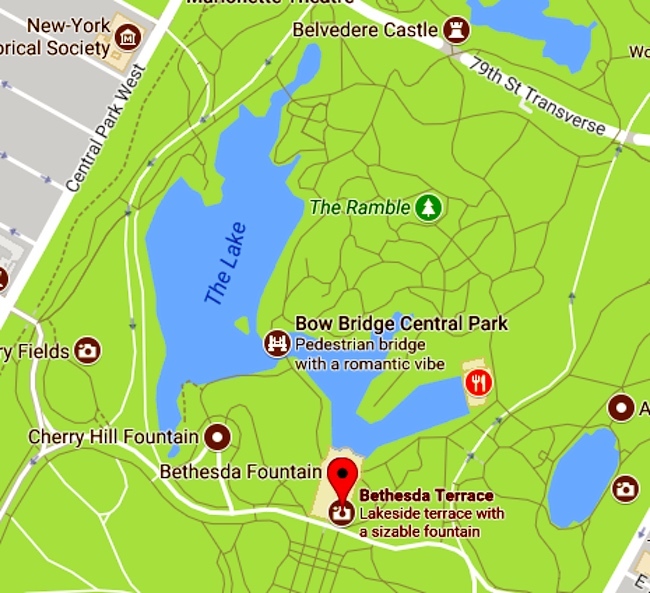 Bethesda Terrace is on two levels, united by two grand staircases and a lesser one that passes under Terrace Drive. They provide passage southward to the Elkan Naumburg bandshell and The Mall at the center of the park. 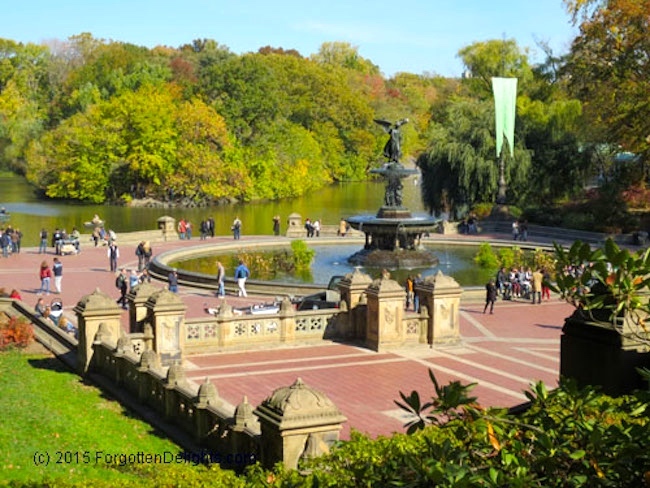 The upper terrace flanks the 72nd Street Cross Drive and the lower terrace provides a podium for viewing the Lake. The mustard-olive colored carved stone is New Brunswick sandstone, with a harder stone for cappings, with granite steps and landings, and herringbone paving of Roman brick laid on edge. … The pool is centered by a fountain sculpture designed by Emma Stebbins in 1868 and unveiled in 1873. Stebbins was the first woman to receive a public commission for a major work of art in New York City. The bronze, eight-foot statue depicts a female winged angel touching down upon the top of the fountain, where water spouts and cascades into an upper basin and into the surrounding pool. It was the only statue in the park called for in the original design. Beneath her are four four-foot cherubs representing Temperance, Purity, Health, and Peace. Also called the Angel of the Waters, the statue refers to Healing the paralytic at Bethesda, a story from the Gospel of John about an angel blessing the Pool of Bethesda, giving it healing powers. In Central Park the referent is the Croton Aqueduct opened in 1842, providing the city for the first time with a dependable supply of pure water: thus the angel carries a lily in one hand, representing purity, and with the other hand she blesses the water below. [The theme of blessing is all over Perestroika.] The base of the fountain was designed by the architect of all the original built features of Central Park, Calvert Vaux, with sculptural details, as usual, by Jacob Wrey Mould. 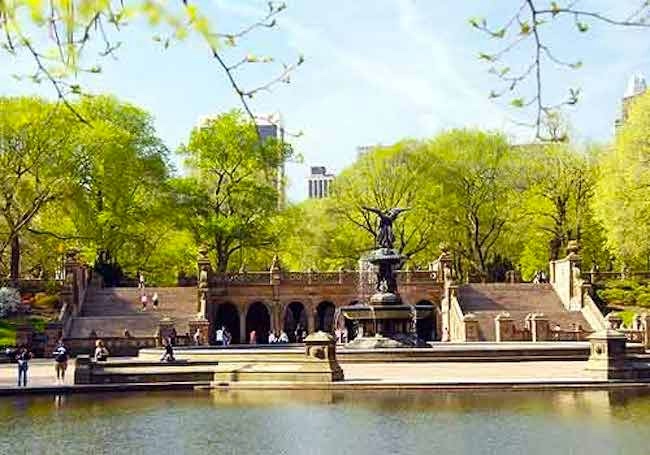 The fountain figures prominently in Angels in America, but the Ramble, across the Lake from the Terrace, also figures in both parts. Notes on performances of Angels. The play was commissioned by the Center Theatre Group at Mark Taper Forum in LA. Part One had its premiere in May 1991 at the Eureka Theatre in SF; Part Two in Noember. 1992 at Mark Taper Forum. The London premieres were in 1992 and 1993. I mention some of these actors because I’ll want to post about them later: in particular, Ron Leibman with his wonderful actor’s face (and only three degrees of separation from me) and Dan Futterman, who many people seem to think has the full name The Adorable Dan Futterman. Connection 1: the 2003 tv miniseries, with Al Pacino as Roy, to the 1980 film Cruising, with Al Pacino as the central character, an undercover cop who spends some time cruising the Ramble (photo in my urban jungle posting). This entry was posted on August 30, 2017 at 4:08 pm and is filed under Actors, Gender and sexuality, Movies and tv, Phrasal overlap portmanteaus, Portmanteaus. You can follow any responses to this entry through the RSS 2.0 feed. You can leave a response, or trackback from your own site.